Councillor John McLellan, Edinburgh City Council. 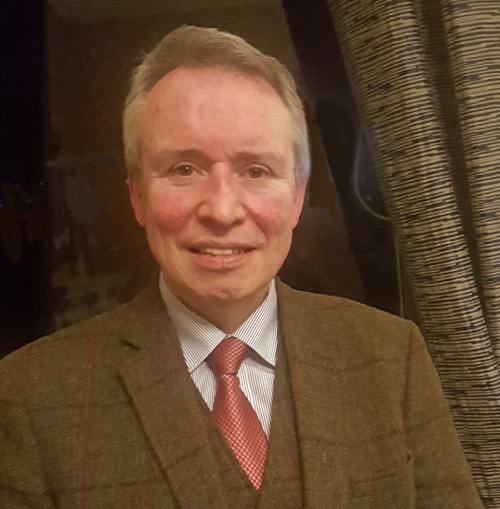 During his career in journalism which began 37 years ago with a weekly column for the Stirling Observer, John had spent fifteen of them in the editor's chair, with two stints at the Edinburgh Evening News and one at Scotland on Sunday and The Scotsman - and throughout this time transport has been meat and drink to him. However his introduction to public transport had come much earlier when as a child he took the train daily from Kings Park on the south side of Glasgow to the High School and then Hutchesons' Grammar, which had given him a lifelong affinity with rail. The Edinburgh Evening News became involved with the campaign against a second Forth road bridge in 1994, but the biggest issue with which he has to deal was the 2005 congestion-charging referendum in Edinburgh. Had it been solely about journeys into and out of the city centre, it might have stood some chance of success, but the outer cordon caught a myriad of other trips that, while in themselves routine, generated too many causes - Sir Tom Farmer driving his wife to the Airport, cat-owners taking their pet to the vet and so on. Following discussions with then Council leaders Donald Anderson and Andrew Burns, the Evening News came out in support on the basis of a trial period, but this was no avail in the vote, which went 3:1 against, thus demonstrating the adage that politicians should call a referendum only when they were sure of getting the result that they wanted. Thereby decoupled from its funding mechanism, Edinburgh Trams lost the line to the Royal Infirmary, and the core network shrank to a route from the Airport to Newhaven. Unhappiness within Lothian Buses now surfaced in the form of recurrent briefings against the tram, which ceased when the Council agreed to put a stop to these and thereafter John's contact became positive about the benefits. The budget stretched only to York Place, but in 2019 Newhaven was again on the agenda and while John was in principle in favour, experience of the last time round had given him a sense of caution towards the business case since, while not claiming to be an expert, he felt that the Council lacked the proper ability to scrutinise both opportunities and risks. Lord Hardie was not going to be rushed into publishing the outcome of his inquiry, and the position of the Conservative Group to which John belongs on the Council was that the City should await his findings rather than be unnecessarily rushed into a commitment. The opportunity had been missed to turn the Borders Railway into a genuine commuter link because it was only single-track and should have been double-track to improve the connection to the Borders. There had always a strong case for the line as far as Gorebridge, but doubts about its popularity beyond there had been dispelled, which made the missed opportunity more obvious. With the City having to find twenty thousand affordable homes in the next ten years, John now detected that the way was being warmed towards revival of the tram spur to Granton, put on hold during the 2008 financial crisis, and could see the sense that this part of north-west Edinburgh was the best place to build new communities - while the route, being a former railway line, might be an easier alignment than the present line. However such thoughts did not play well to the court of public opinion, and the majority of the Edinburgh public did not see tram funding as money well spent. Why, said people, are you not able to replace the life-expired Meadowbank Stadium with a world-class facility, yet you can afford trams? In John's view things had gone wrong last time when the Scottish Government pulled out, leaving the City to make mistakes, and his fear was that without the involvement of Transport Scotland the same thing could happen again. Yet with the decline of oil and gas Edinburgh was ever more important to the Scottish economy, the city's infrastructure should be developed in partnership with central government, and with the land at Granton now all sold by Centrica to the Council, new ways must be found of investing in transport infrastructure without this appearing on the public balance-sheet. The new infrastructure funding projects did not have buy-in from the Council as yet, but the opportunity was there. The property experts were now getting into dialogue with the pension funds to evolve the right mechanisms, but the experience of the Edinburgh Royal Infirmary and other PFI projects had left the public understandably suspicious of innovative financing. It was disingenuous to say that the tram completion had no impact on Council services because Lothian Buses was being expected to deliver £7M a year for three years as well as the usual dividend. This would make it more difficult to guarantee the usual level of payment which the Council used to support essential services. It also affected LB's ability to reinvest in its routes, as evidenced by the non-replacement of the minibuses for the 69 service. The Edinburgh South Suburban Railway had lately featured in John's column, and he could see the temptation to say that it must be revived since the image that it presented was of shiny rails slicing through the city. His instinct was however to say that it went too much around rather than into the centre, making radial bus routes always quicker, and capacity constrains would point to the desirability of another city-centre terminal, reviving memories of the old Princes Street Station, but who was going to pay for that? Notwithstanding the undoubted lure of light and heavy rail, the bus would always be at the core of Edinburgh's transport network, and users had been well-served by investment over the years in a modern fleet which was in marked contrast to that on offer in other parts of Scotland. However to remain competitive with the private car, Lothian Buses wanted the Council's commitment to better infrastructure, which could draw it into debate about cutting out lightly-used stops. Too often since devolution the Scottish Government's attitude had seemed anti-Edinburgh, with the Labour/Lib Dem coalition transferring Scottish Natural Heritage to Inverness and the incoming SNP a dozen years ago pledging to axe both the airport rail link and the trams. A more mature attitude of sharing in success would seem desirable in the uncertain times that now lay ahead.